We are pleased to inform that NACE International Gateway India Section (NIGIS) is organizing an Educational & Training Programme on “Pipeline Corrosion” from 16 – 18 June 2016 at Hotel Rodas, Hiranandani Gardens, Powai, Mumbai. Pipeline Corrosion training programme covers various aspects of corrosion of pipelines and methods available for prevention and control of their corrosion. The intention is to arm pipeline personnel with sufficient knowledge on pipeline corrosion to maintain integrity of pipelines. Corrosion is an unavoidable but curable threat to economic growth. Approximately 4% of GDP losses amounting to several thousand crores of rupees are caused by this menace each year. It affects the Industry from infrastructure and transportation to production and manufacturing sector. Corrosion Management is the key to safeguard infrastructure and boost the production process of the industries driven by the improvement of their capital productivity, operational reliability, efficiency, performance and health & safety of the assets. In today’s competitive Scenario, industry is looking at saving each penny, avoiding any failures and ensuring world-class procedural conformity. Corrosion Management is a systematic and holistic approach to reduce risks of corrosion failure thereby extending life span of a plant and ensures integrity of new plant. Confederation of Indian Industry (CII) through it Corrosion Management Cell has worked towards creating awareness about corrosion prevention strategies through Training Programmes, Conferences, Seminars and Workshops. Detailed Corrosion Audits are CII’s forte that identify ways to measure, control and prevent corrosion. The endeavour is also to equip plant personnel to address corrosion issues. To give an impetus to corrosion management culture in the area, CII is organizing a two day Training Programme on Corrosion Management on 10-11 June 2016 in Mumbai.Enclosed the detailed circular & reply form. Our Viewpoint: This is another landmark in the history of Indian oil sector in taking the consortium of government owned oil majors to the land with huge oil reserve. It is a good opportunity for Indian expertise to interact with Russian talent force for tackling the challenges associated with highly critical conditions and finding technology answers. Now is the best time for research resources in India to establish an active connection with Russian counterparts for promoting the joint industry projects in the critical areas of oil and gas to find cost-effective exploration, production, operation and maintenance methods complemented with the proven materials and associated corrosion management. Indian firms on Wednesday clinched a slew of deals worth around $4 billion with long-time strategic partner Russia for purchasing stakes in two key East Siberian oilfields operated by Rosneft, the world's largest publicly-traded oil company. The move is expected to bolster India's energy security amid subdued global oil prices. As part of the deal, a consortium of three public sector undertakings (PSUs) - Oil India (OIL), Indian Oil Corp (IOC) and Bharat Petroleum Resources (BPRL) - will pay $1.28 billion (Rs 8,618 crore) for a 29.9 per cent stake in Rosneft-operated Taas-Yuryakh oilfield based on a share purchase agreement (SPA) signed on Wednesday. The deal values the oilfield at $4.2 billion (Rs 28,280 crore) and is expected to be closed by September. India clinches stake in Russian oilfields "The deal parameters will be reported to the market later. These transactions provide Indian companies access to production on Russian territory, and Rosneft is gaining access to the opportunity to operate in the Indian market. Therefore, we are establishing a reliable energy bridge between our countries," Rosneft Chief Executive Igor Sechin told reporters on the sidelines of the signing ceremony, following a meeting with Petroleum Minister Dharmendra Pradhan. The Taas-Yuryakh field is rich in gas with presence of layers of oil. Its current crude oil production hovers around 20,000 barrels of oil per day (bopd). The management is working on a target to raise production to 100,000 bopd in around two years. The field houses 137 million tonne of liquid hydrocarbon and 181 billion cubic metre (bcm) of gas. "As a result of this deal, we will get the rights over 30 per cent of the current production. The deal also stipulates around $180 million capital expenditure by the consortium in the oilfield," said a senior executive close to the development. India - Oil and Gas - Thursday was golden day for oil & gas, ONGC Celebrates - Our Viewpoint: Oil companies in India rely on the foreign resources to deal with material selection and corrosion control. Our viewpoint: Increase in CAPEX is a boost for the service providers and professionals who see India as the destination for delivering the world class services during the present CAPEX downtime experienced by global oil majors outside our country. Corrosion management is one of the major challenges encountered in Deepwater projects. Oil companies in India rely on the foreign resources to deal with material selection and corrosion control. Our engineering professionals migrated to other countries for employment in Corrosion Management since there was no scope for job opportunities in India. Now is the time to oil & gas companies in our country to open their doors for collaboration with the Overseas Indians talent system. ONGC is celebrating the Cabinet decision of getting back its crown jewels — the Ratna and R-series oil and gas fields — which were previously awarded to Essar Oil. Bloomberg TV India caught up with the PSU explorer’s CMD Dinesh Kumar Sarraf. What’s your first reaction to the Cabinet decision to return Ratna and R-series blocks to ONGC from Essar Oil? Historically, the Ratna and R-series blocks were discovered by ONGC. We developed it, constructed the platform and started production. And at the time the then government decided that it should be auctioned and given to a consortium of ONGC and a private sector company. But the government, due to its own difficulties, could not implement that decision. And we have been taking up with the government that this should be given back to us so that we can start our work in that block and start production. It is good that the government has finally taken a decision that it will be given back to us. Now our plan is to make a physical inspection of all these facilities because we have not gone to that platform and seen those fields in the last 20 years. We will take our engineers there and see what is the physical situation of those facilities and how much of that can be utilised now. What’s your view on deep water gas price being considered at $6-7 per mmBtu? How do you see that incentivising further investment in these deep-water blocks? I would say it is a dream decision taken by the government to help the oil and gas producers to step up gas production in the country. I want to say that Thursday was a golden day for the oil and gas industry. What does it mean for ONGC? We have made very significant discoveries in the eastern offshore, more particularly in the KG basin. We have not been able to monetise these discoveries because of the gas price, which we thought was low. We have taken up this matter with the government and I must thank the government that they have reviewed the gas prices. But will it incentivise the capex and investment into the sector, especially in your company? Yes, certainly. We are going to make a capital investment decision in less than a month’s time to monetise the KG-DW9 and 10 blocks. And we feel that within three-and-a-half years or so, we would start production. The peak production is going to be about 17 million cubic metre of gas per day and more than 75,000 barrels of oil per day. Our Viewpoint: Expansion of hydrocarbon industry is always a Help for the service providers and talent force at the present time of downward trend of oil & gas industrial situation outside India. Our country has supplied a huge talent pool to the international and national oil companies in the overseas. The present job market is not in a promising position. Now is the best time for companies in India to use the inland and overseas Indian professionals for sustainable development in this sector. Corrosion is one of the major challenges encountered in deepwater projects. The present policies on corrosion control and integrity management have to be modified to a great extent to meet the future demands. It is essential to calculate corrosion footprint and incorporate the best practices for corrosion control and asset integrity in the design stage itself. Faced with an investment challenge in the upstream oil and gas production sector, the Union Cabinet on Thursday announced major reforms to woo foreign investors and boost the performance of the sector. The Cabinet Committee on Economic Affairs (CCEA) approved a much-awaited policy, granting pricing and marketing freedom to companies exploiting hydrocarbon reserves in difficult geological areas. The aim is to ramp up domestic output to cut energy imports. It approved a new Hydrocarbon Exploration Licensing Policy (HELP) that will replace the existing New Exploration Licensing Policy (NELP) regime with more investor-friendly provisions of revenue sharing and open acreage licensing. Pricing freedom will benefit exploitation of 28 discoveries with 2.6 trillion cubic feet of hydrocarbon reserves located in deep water, ultra deep water and high pressure-high temperature areas, benefiting two of the country's largest upstream companies - Oil and Natural Gas Corporation (ONGC) and Reliance Industries Ltd (RIL). The policy allowing premium pricing for such areas would cover all the fields where production was yet to start as on January 1, 2016. Besides, it will also benefit an additional 10 discoveries which have been notified and whose potential is yet to be established, said Dharmendra Pradhan, petroleum minister. Our Viewpoint: It is great to see the acquisition and collaboration with the foreign supply systems to strengthen the market presence and deliver collective experience for resolving process and corrosion issues in oil & gas industry. Challenge is always there to prove the real need for chemical treatment in many industrial processes. Actually, these chemicals differ from the commodity ones. It is not the supply of chemical alone. Each process requires a great deal of analysis in designing a customised treatment to suit the real world conditions that call for continuous research and development support. Considering the complex nature of chemical treatment, it is technologically advisable to have a good blend of R&D with the operation and maintenance of such systems and find cost-effective life-cycle answers. Our country's chemistry and chemical engineering oriented talent pool can be utilised to meet the growing demand and design industry-friendly applied education. Dorf Ketal Chemicals India has completed the acquisition of US-based Flow-Chem Technologies to expand in oil and gas upstream market. Flow-Chem is a specialty oilfield chemical provider that operates across Gulf of Mexico and US onshore market with blending facilities located at Rayne, Louisiana and Pleasanton, Texas in the US and multiple warehouses. "This acquisition is aligned to Dorf Ketal's strategic vision of having significant presence in both upstream and downstream hydrocarbon market," the Mumbai-based company said in a statement. The acquisition would enable bringing in synergies of the research and development capabilities of both the companies in the oil and gas sector. "The acquisition provides a ready conduit through existing contacts to introduce Dorf Ketal's differentiated technologies to accelerate entry into the US upstream market," said Subodh Menon, Dorf Ketal's Founder & Director - Operations & Business Development. Menon said that there will be manufacturing and supply chain synergies to increase cost competitiveness in the challenging oilfield market. "Flow-chem's portfolio of oilfield production and drilling products will be combined with Dorf Ketal's products currently servicing offshore fields in Brazil to improve capabilities of both entities," said David Johnson, President, Dorf Ketal Oilfield Chemicals. In January this year, Dorf Ketal had announced the acquisition of Filtra Catalysts and Chemicals Ltd.
Dorf Ketal Chemicals India is a privately owned specialty chemical company with operations in the Asia Pacific, China, Europe, South America and North America. It provides formulated specialty chemicals to upstream and downstream oil and gas markets and is market leader in organometallic catalysts and cross-linkers serving a broad range of applications and industries. Our Viewpoint: Expansion of refinery infrastructure by India's Navaratna company is an encouraging news for the professionals and business houses associated with FEED and EPCC activities. When infrastructure is expanded, historic analysis of existing process units needs to be carried out to choose the inherently safe and cost-efficient design. We do not find any centralised database in documenting the best practices and failures. Corrosion risk assessment is one of the main components to formulate the suitable Life Cycle Costing for facility rejuvenation and expansion. There will be a significant shift in corrosion behaviour of materials when new process streams are introduced into the old assets or operated under highly complex conditions. It is better to incorporate proven materials, practices and standards in the initial design stage itself. A large pool of Overseas Indian Engineering talent serves many refining and petrochemical complexes outside India. Companies and design houses in India need to open their doors for collaboration with this talent system for seeking its global experience. NEW DELHI: State-owned Hindustan Petroleum Corp Ltd (HPCL) plans to invest Rs 45,000 crore by 2020 in expansion of its Mumbai and Visakhapatnam refineries as well as augmenting its marketing infrastructure. While Rs 21,000 crore would be invested in refining capacity expansion, Rs 9,000 crore would be spent in marketing infrastructure till 2020. A total of Rs 14,000 crore would go into joint venture refinery projects, natural gas business and upstream oil exploration, the company said in an investor presentation. 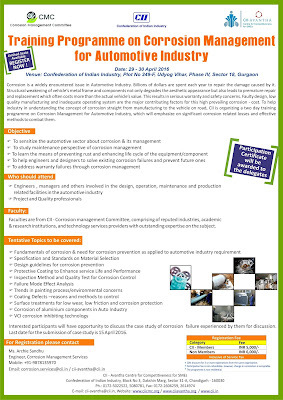 India - Automotive Industry - Anti-corrosion steel standards to be set for Indian cars. Our Viewpoint: The buyers have no clue for the cost of painting or any anti-corrosion treatment packaged with the purchase price of car. Chennai: Indian roads will soon have cars with perforation warranties once the Bureau of Indian Standard (BIS) standardizes the specifications of the steel used in automotive industry, said officials of the International Zinc Association (IZA) on Wednesday. “Only around 20% of the cars manufactured in India are using galvanized steel and that is exported to the other markets,” said Kenneth De Souza, consultant, IZA (Global). Using cars that have a perforation warranty is the right of the customer added A.S. Khanna, professor, Indian Institute of Technology (IIT) Bombay. The IZA in a joint venture with IIT Bombay and Hindustan Zinc Ltd (HZL), a subsidiary of Vedanta Ltd, has approached the BIS for standardizing the use of galvanized steel in vehicles. “IZA is working with BIS to create a standard that brings India to the level of global players in terms of using galvanized steel for automobiles. We have submitted a draft to the bureau with specifications and BIS is reviewing it. In the process, all the car companies have to mandatorily use the approved material in their cars,” said De Souza. Galvanizing is a controlled coating of zinc on steel in order to protect it from corrosion. The zinc sacrifices itself slowly but steadily to protect the strength and safety of steel in the automobile body. The process apart from improving the safety of the car, leads to weight reduction which in turn reduces emission. A survey conducted by IIT Bombay last year revealed that almost 60% of cars suffer from corrosion effects like rust, blisters and perforation. It also found that galvanized cars show significantly improved performance by 60%-70% as compared to non-galvanized cars of the same model. Global car makers offer an anti perforation warranty for up to 12 years. Though India has started using galvanized or galvanneal steel for body panels of cars, they are implemented only in export models and the domestic cars are non- galvanized. 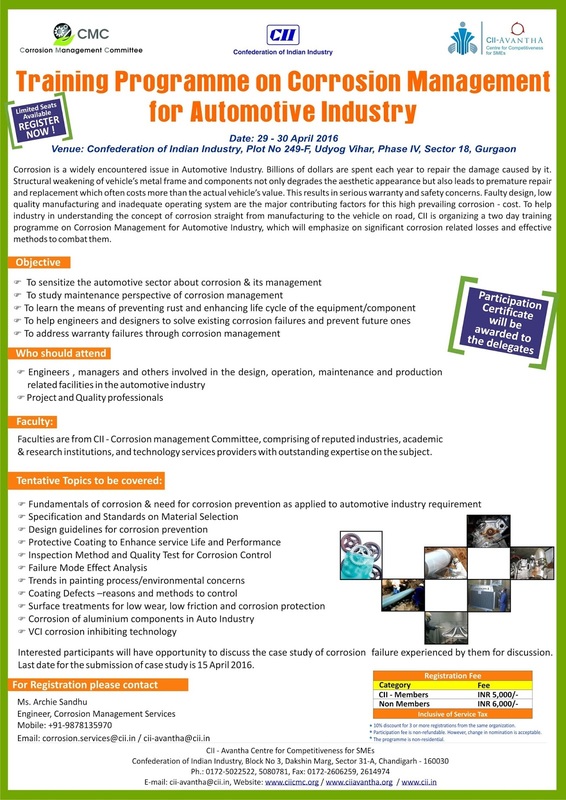 “India loses around 5% of GDP each year in corrosion losses. Corrosion mitigation will lead to sustainable vehicles and infrastructure for future generations,” said Vikas Sharma, chief operating officer (Smelters), Hindustan Zinc Ltd.
“The incremental cost when the Indian auto makers opt for galvanizing steel would come around Rs.8000 for a vehicle, which is only 0.02% of the total amount,” said Rahul Sharma, International Zinc Association (India). Galvanized steel has been used for decades in Europe, North America, Japan and Korea for body panels. In India, for the export models 70% of the body is galvanized while the one for the domestic market will have only 20% galvanization of the body parts. India - Railways - Rail track galvanisation can lead to 4% GDP savings, says global zinc body International Zinc Association (IZA) - Our Viewpoint: Our country needs the implementation of corrosion control measures in a proper way. Our country needs the implementation of corrosion control measures in a proper way. Corrosion losses with reference to GDP reported here in railway sector do not provide the realistic figure. There are different methods available for corrosion control. Life cycle costing is very much needed to choose the right method of protection and execute the application in an optimized way. We can't directly jump to a conclusion for implementing single point solution without justification. Some methods appear to be cheaper in the initial phase, but demand for close vigilance in the latter stage. Cost for every component/process needs to be included in LCC. NEW DELHI: Asserting that use of galvanised rail tracks could result in savings to the tune of 4 per cent of GDP, global zinc body IZA has urged Railway Minister Suresh Prabhu to go for such technique to avoid losses arising out of frequent track replacement from corrosion. This will also help in increasing longevity of rail tracks and ensuring passenger safety. "Galvanising of railway tracks ... would not only be significant initiative towards safety of trains but would also give more life to the railway tracks," International Zinc Association (IZA) has said in a letter to Prabhu. Urging Railways Minister to consider use of galvanised railway tracks for the safety of commuters and for longer life of rails, it said, "Experts estimate losses of almost 4 per cent of GDP per year on account of corrosion and Railways is nicely placed to minimise this loss." IZA Director Rahul Sharma said that motivated by initiatives taken by the Railways Minister towards driving innovation and renovation in Indian Railways, the body has urged him to pay attention in this regard. "Indian Railways requires corrosion-free tracks in case India is considering Bullet Trains. The entire change would not only be cost effective but India would also be the first country to initiate such step towards passengers safety," said Sharma. He said as per reports by IIT Kanpur and Steel Authority of India Limited, large funds are invested to upgrade and maintain the railway track system in India. One of the significant aspects of railway track maintenance is the detection of corrosion and the replacement of corroded rails. Corrosion of rails causes huge economic loss because of frequent rail replacements, he said adding that rail failures due to corrosion affect the safety of commuters and disturb normal traffic. "The economic cost due to corrosion of rails is very significant. The rails have a life of 800 gross million tons, which works to approximately 12-13 years under normal traffic conditions in India. Corrosion reduces the life of rail to nearly half its expected life," he said. "The annual loss due to pre-replacement of corroded rails is huge about Rs 440 crore. We have requested the Minister for his time to explain the benefits," he added. IZA, a non-profit association established in 1990 in Brussels, has been active internationally as well as in India for sustainable development of applications of zinc, including the essentiality of zinc in human health, crop nutrition and corrosion protection of steel.